Wood butter is a product I make a fair amount of use of, myself. About once a year, I use up a tin of it to recondition wooden dishes and utensils, and there’s nothing better when I’m carving to use as a finish that I don’t have to worry about! So, here’s a run down on just how I do it. 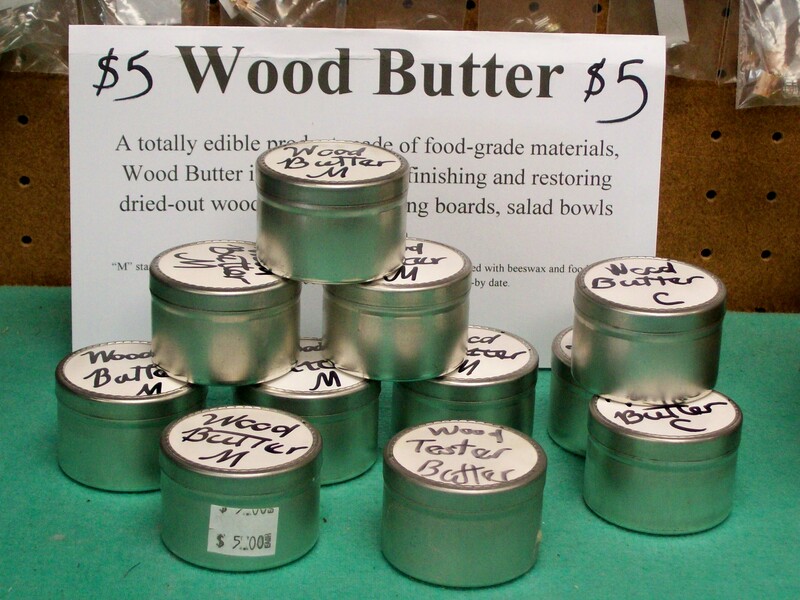 Make your own, or come in to the shop to buy a tin for $5 and save yourself hunting down the materials! So first collect materials. Everything must be food-grade. Beeswax, cleaned and melted into the can…. well, I had to carve it *out* of the can! Then equipment. I’m doing larger quantities, so I usually have a dozen or so tins, but anything that can be heated and not melt and shallow enough to get a finger to the bottom of will work. I *don’t* recommend mason jars, unlike some other people! You waste a lot, both time and materials trying to get the stuff out of the jars. Altoids tins work REALLY well, cleaned lip balm containers, that kind of thing. I’m considering experimenting with lip balm tubes! You also need something to stir with (I’m using a bamboo skewer here…) a heat-proof, nukable container for melting and mixing and something to measure with. You can see that I have a pyrex measuring cup combining a couple of those and a set of good measuring spoons. Measure 3 parts oil to 1 part beeswax into your heating cup. That translates for 8 tins (or 12 smaller ones) to 3/4 cup oil to 1/4 cup wax (plus 1 TBPS EO, more on that below). Or for a small quantity: 3 tablespoons oil to 1 tablespoon wax plus 1/4 tsp EO). What I do is put in the liquid measure for the oil and then shave the beeswax into that until it comes up to the 2nd mark (3/4 cup oil and then add beeswax until it reads 1 cup….) Be aware of the meniscus (where the liquid curves up at the edges) You want to read the BOTTOM of the curve, not the top edge. Zap for 30 seconds at a time and stir between until everything is completely melted. Make sure your coconut oil is not solid before pouring. Zap 30 seconds in the nuker (metal cap OFF) and shake before putting it back. 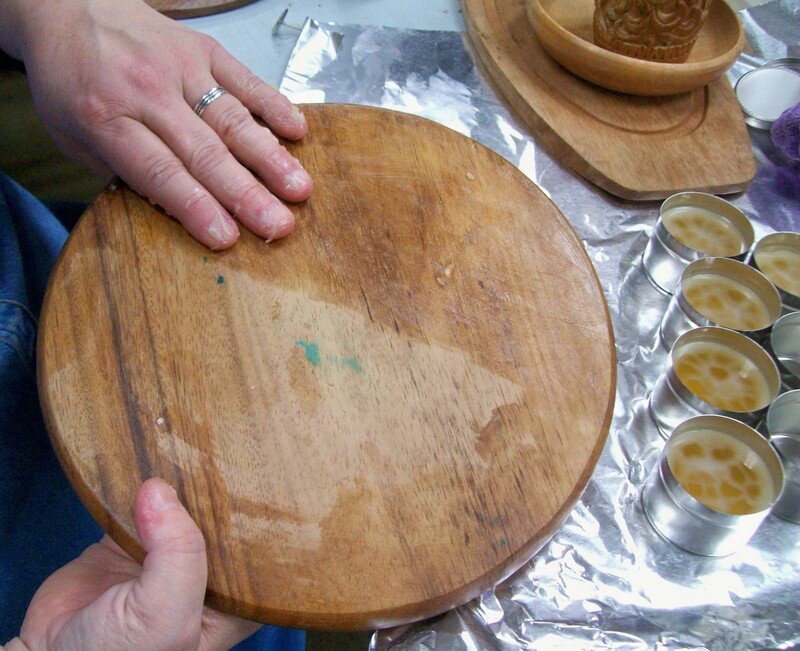 After your beeswax and oil are melted together add the EO and stir. Measure and add your EO and stir very, very well, then pour….which is the advantage of a pyrex measuring implement! So, here’s my completed display at the shop!